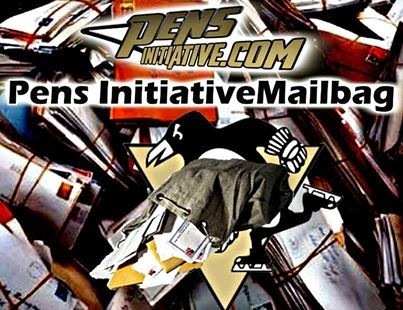 Hello and welcome to the initial Pens Initiative Mailbag, where we'll give readers a chance to ask whatever questions they may have regarding Penguins' hockey. Have a question about the way the team is playing? Moves they've made? Whatever it is, contact us at PImailbag@gmail.com and we'll get you an answer as soon as possible. Starting this thing off on a positive note! In all seriousness, though, thanks for the question Steve; a lot of Pittsburgh fans seem to be wondering/possess strong opinions about what would or should happen if the Pens, once again, stumble in the postseason. In a fairly weak Eastern Conference, I'm not ready to write the Penguins off quite yet. Yes, there are question marks and, yes, a team like Boston will prove a significant hurdle but the Pens still represent a legitimate threat to reach the Final. Doesn't mean it'll happen but it's very possible. Of course, if the Pens do come out of the East, any number of Western clubs would likely present even greater challenges but we'll cross that bridge if/when we get there. That being said, I don't necessarily believe anything short of a Cup results in a total restructuring of this squad. Barring a first round exit or another humbling defeat (either of which are admittedly possible) along the way, I sense Ray Shero will look to mold this roster rather than blow it up. In talking Letang, let me first say his health and well-being emphatically trump any hockey related decisions that may come down the road. For the immediate future, all things sports related belong squarely on the back burner. However, if and when Letang returns, I simply don't envision a scenario in which he's shipped out of Pittsburgh. For one thing, prior to the sobering stroke he suffered, the former-Norris Trophy finalist and Olli Maatta were considered the future of the Pens' blue line. That won't likely change, assuming Tanger wants to return and can regain his old form. Aside from any future plans, though, think about it from an opposing general manager's point of view. Say Letang doesn't come back this year; would you deal the assets likely required to pry him away without knowing exactly what to expect upon his return? After all, it's not like he's coming back from a broken bone. He's recovering from a serious medical condition, one with the potential for countless unknowns. Couple that with Letang's long-term contract and, in the cold, cruel world of professional sports, some general managers might hesitate to make a move for the smooth skating defenseman. Sure, there's a hell of an upside but bringing in someone who recently suffered a stoke would also represent a significant gamble. And, as a result, it's a move that just doesn't seem plausible. With regard to Malkin, I just don't see it. With the Pens pursuing Ryan Kesler and setting their sites on a return to the three-center model, it's highly unlikely Shero would be willing to deal one of the game's most dominant pivots, a former-Hart and Conn Smythe Trophy winner. Throw in the nearly unparalleled chemistry shared between Malkin and James Neal and it just seems like too much to give up in the name of shaking things up. A tumultuous postseason may result in some moves, but they won't involve Malkin. Thanks for the questions, Eric. Worked out as the perfect follow up to Steve. Make no mistake, changes are coming in Pittsburgh this summer. But, to me, the moves won't necessarily be about playoff success or failure; they'll mark a period of transition. Start with the blue line. With Brooks Orpik, Matt Niskanen and Deryk Engelland all headed for free agency, it's almost impossible to envision a scenario in which all three return to Western Pennsylvania next year. And, while Shero faces some tough decisions, Niskanen will surely represent one of the Pens' top priorities. After all, if the defenseman actually reaches free agency, no shortage of suitors will exist for the blossoming blue liner. Should the Pens face that reality, Pittsburgh could potentially lose out on at least two of those free agent defensemen. With multiple veterans potentially moving on, we could finally start to see promotions for some of the prospects Penguins fans have heard so much about. Indeed, with Brian Dumoulin, Derrick Pouliot and et al anxiously waiting to prove themselves at the next level, the Pens project to ice a much younger blue line in 2014. Up front, only seven forwards are signed beyond the 2013-'14 campaign, creating the potential for more transition. With the top-six (outside of Jussi Jokinen) slated to return next year, Shero can focus on reshaping his forward depth. A healthy Pascal Dupuis and Beau Bennett will surely help but the Pens need to find a way to add production from their bottom-six. In addition, they'll surely look to add size and grit, to become more difficult to play against. Ultimately, though, how the club fills out that bottom-six will be a function of whether or not Shero successfully obtains Kesler (retaining Niskanen may also prove a factor). Because, it's not necessarily a question of whether or not the Pens will revisit the idea of acquiring Kesler. As Rob Rossi reinforced this weekend, the Penguins covet a revival of the three-center model that landed the squad in back-to-back Finals a few years back. And, in the eyes of Pens' management, Kesler is just the man to help re-establish that formula. So, the real question becomes, will Shero dangle enough bait to make the Canucks bite on a deal? Because, with the potential for more teams to enter the sweepstakes this summer, the former-Selke winner won't come cheap. Whether or not the Penguins pay the price will go a long way toward shaping the Pittsburgh roster for the foreseeable future.